Do You See Yourself in Any of These Situations? People seek memoir writing help and support from many different situations -- do any of these sound familiar to you? You have reached a good place in life, and want to "take stock" with a personal memoir - how far yo've come...what you have learned...what you believe in. Your family is encouraging you to record your life story, as they are worried about losing your history. You would like to tackle something new and challenging for your own satisfaction - writing a memoir sounds interesting. You're part of the "sandwich generation," helping parents and children. 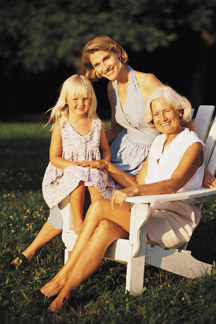 You want to enrich your family and strengthen the bond between generations. A family milestone is approaching - perhaps an anniversary, birthday or retirement. You want that once-in-a-lifetime gift to commemorate the memories and achievement. Your family is facing an uncertain future, perhaps due to a recent death, illness or separation. You want to make certain that you say what you want to say, and save what needs to be saved, for your family’s sake. You have written or recorded your autobiography, or started to, and need some help taking it to the next step. If you see yourself or your loved one in these descriptions, we offer help for memoir writing and other formats. We created Extraordinary Lives to help people who want to share and preserve stories, for the joy of doing so right now and the legacy it leaves for the future. There are many approaches to creating memoirs. You'll definitely want to find someone you are comfortable with - after all, you may be spending a good amount of time with your "personal historian." Whether you are looking for someone to create a life story from start to finish, or just need some minor memoir writing help to move your own project forward, we are happy to provide you with just the help you need. When you think about it, what is more personal than a memoir? We believe that all aspects of your memoir should reflect your personality, lifestyle and preferences. This is why we are not in the "cookie-cutter" memoir business. Every memoir reflects many choices made by you -- format (book, video, etc. ), content, how it looks, and so on. Another difference -- we love our final products and are certain you will too. But we believe the process of creating a memoir is just as enriching as the result. We want our work with you to be enjoyable, relaxing and something to look forward to. Our style is professional, but never stuffy. Combine our friendly approach with your life stories, and together we will forge a working friendship filled with joy, laughter and likely a few tears. One last thing - memoir projects are a significant investment for you and us. We want you to feel completely comfortable from start to finish, so we use a working agreement that gives you flexibility. You are free to adjust, enlarge, postpone or even stop your project at any point, whatever suits your needs. Return to the top of Memoir Writing Help page. To read more about our specific services, visit Our Services.